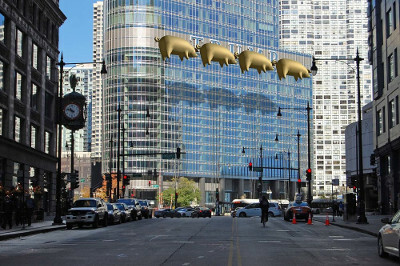 Artist Jeffrey Roberts of Flying Pigs on Parade wants to use four giant inflated pigs to obscure the Trump Tower Chicago sign for a one-day exhibition/protest. According to his site, ""Flying Pigs on Parade" is a visual response to the loud, illogical and frequently hateful expressions that polluted the presidential elections and that now define the actions of our U.S. leadership." Roberts has worked with Roger Waters to get permission to use Pink Floyd's iconic flying pigs from the days of the Animals album and is now working with officials in Chicago to get permission to fly the pigs for the one day in front of Trump's building.